Following in the tradition of the Summit Skiboards “one-skiboard-does-it-all design”, presenting the Summit SK8 96 cm Rocker/Camber skiboards. Following in the tradition of the Summit Skiboards original “one-skiboard-does-it-all design”, presenting the Summit SK8 96 cm 3D Rocker/Camber skiboards 2019. As the name implies, these Skate (SK8) skiboards are truly like skating on snow, super easy to turn, stop, spin and whatever you choose to do. 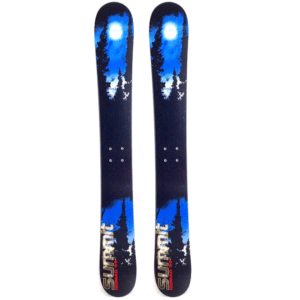 These special Skate (SK8) 96m skiboards are true all mountain, all condition skiboards. AND the best is, on those blue sky, sunny, untracked powder days, the ones you dream about — OMG! You will never be the same, seriously! Yes, powder hounds and speed demons — wait until you ride these boards! Like its longer brothers the Invertigo 118 and GroovN 106, these are designed for all mountain riding, being at home anywhere in the ski resort, including those breath taking steep chutes you see in the ski movies, ripping through moguls or flying through the glades. 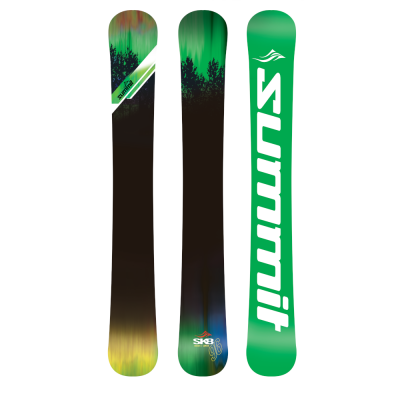 Summit SK8 96 cm 3D Rocker/Camber Skiboards 2019 offers a unique combination of 15% Rockered front tip, 80% traditional camber and 5% rockered tail. If you love super short turning ability, yet may encounter many different conditions, these are the skiboards for you. With traditional camber, you get amazing edge grip on ice/hardpack. These rocker skiboards also feature 4 stainless steel inserts allowing the use of Snowboard bindings like the Technine Custom Pro DS Snowboard Bindings. These can also be mounted with release bindings like the Atomic L10 or Atomic FFG 12 bindings. Read more about various binding options. These Summit Source SK8 96 cm 3D Rocker/Camber Skiboards 2019 are full on symmetrical twin tips (for those who love to ride or land jumps backwards). The tip-to-tail Northern Birch/poplar wood core provides a super smooth flex allowing you to truly enjoy your ride every time coupled with the wide body construction and fast sintered bases that offer surprising speed. These will definitely bring a smile to your face all the way down the run. Ready to play? 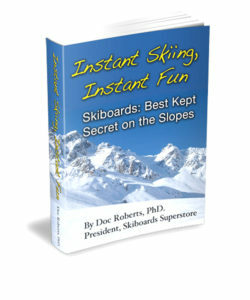 Recommended for: Beginners, Intermediate to advanced riders. Great for: Adventurers! These excel in powder and soft snow, big mountain riding, cruising on the open runs (be it intermediate or advanced) and basically anything you care to do. Base color will vary between green with white lettering and white with green lettering. Tuning: We recommend getting your bases hot waxed before riding. You can choose our Add a Hot Wax Service and receive your skiboards waxed and ready to ride. You can also choose to do it yourself with our Skiboards.com Quick Tune Kit to maintain your skiboards in optimal condition. 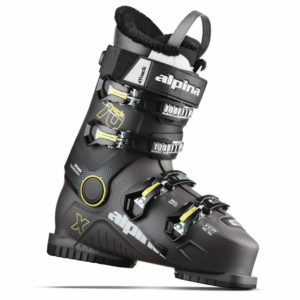 Atomic L10 Step-in Release Bindings. 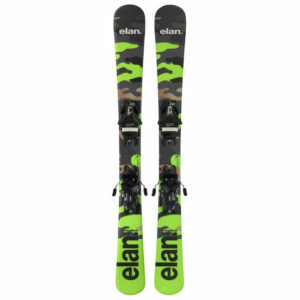 The L10 bindings are our choice for adjustable, step-in release bindings this season. These come with free mounting and free wide brakes. Adjustments can be done by hand and fits ski boot sizes 261-384 mm (approx. size 4 – 14 U.S.). Height: 30mm. Atomic L7 Step-In Release Bindings. The L7 bindings are great step-in release bindings. Come with free mounting and free wide brakes. Adjustments can be done by hand and fits ski boot sizes 229-336 mm sole length (approximately US Size 2-11). Height: 30mm. DIN 3-7.5. Atomic FFG 12 Step-In Release Bindings. Built for high performance, these automatic release bindings come with a higher DIN range of 4-12. This binding is slightly oversize with extra long wings for great lateral transmission, yet rides lower on the skiboard (height 16.5 mm). If you ride your skiboards hard, in moguls, parks or wherever, these are a good choice. Boot size range is 260mm to 384mm (approx. 4-15 US). Easy to adjust by hand. Skier weight 94-264 lbs. Technine Custom Pro DS Snowboard Bindings. The Custom Pro DS features a partial wrap around cuff at the top (referred to as a “double scruff” or DS for short) that provides additional stability and even quicker response for aggressive carving and maximum performance with skiboards. The three rachet buckle straps make it easy to get just that perfect fit. Fits snowboard boot sizes 7-14 US. This kit includes Technine Custom Pro DS Snowboard Bindings, all hardware, Summit Riser Kit with all hardware and two Quick Leashes are included as well. Everything you need to mount and ride with snowboard boots on skiboards. You can also use your own snowboard bindings with our Snowboard Bindings Adaptor Kit. ABS Sidewall Construction: Crafted with ABS sidewall construction, the Rocker 96 construction provides many advantages over cap construction. Among these advantages are increased torsional stability, greater edge protection, enhanced power transfer to the edges, improved vibration dampening, greater strength and a full length flex from tip to tail. Translated, these will ride like no other skiboards you have ridden.